HADEN HAS $5,000 TOWARD HIS ADOPTION! I am doing a happy dance here! We are halfway to our goal and still have five solid days left. I think this can really happen!!! If you've meant to donate but just haven't gotten around to it, now is a good time. (: Any amount will help! And to give you a little added incentive, I am posting a link to Haden's sweet video. Doesn't he just seem like a stellar young man? Parker watched it and talked about how well he thought Haden would fit in at school in America. The two interested families have not committed yet and I know that this fundraiser can boost those chances. (: Time is running out. Let's get Haden a family!!! "Hi, my name is ZYL and I am in 6th grade. I like sports very much. I play basketball every day after school. During weekend I like to ride my bike to places far from city. Sometimes I ride for 1-2 hours. I like to study too. My favorite subject is math as I feel it is a very interesting subject. I like to read and I read a big book recently about Chinese history. I think it's an amazing book. My dream is to become an astronaut so I can solve the mystery which we don't know yet. I really want to have a family-- to have Dad and Mom. I know they can give me their love and care. And I can do so much with them too- we can go for walk after dinner, ride bike, play sport. I will love to be around them all the time. I pray I have a loving family soon." Again, so grateful to ALL who have donated and shared!!!!!!!! Now, on to another sweet girl that has captured my heart. Oh my, isn't she precious?!!! When our staff first visited the Yuxi orphanage in Yunnan province, one precious little girl stood out from all of the other children. Perhaps it was the way she hung her head, as if in shame. Quiet, and shy, there also appeared to be a deep sadness held within her spirit. Heartsent Adoption's orphanage partnership with Yuxi is brand new for the agency and for all of the children at this orphanage, as well. Previously, the children in the Yuxi orphanage were in foster care homes and smaller centers in the area. Alia has recently turned 6 years old. She has glaucoma of her left eye, which has progressed to the point that it will surely need to be removed. 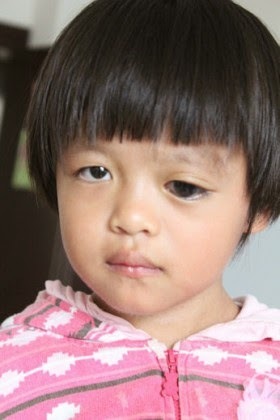 She is embarrassed about the appearance of her eye, and in constant pain due to the increased pressure within her eye. Alia is known to be gentle, and loves to sing and dance. Alia needs a family who will help her receive the medical care she so badly needs, and will help her blossom! With proper care and preventative measures, we hope her remaining eye will be healthy. Alia is a sweet and loving little girl, who wants a family of her own. It breaks my heart that she is embarrassed of her eye and even more that she is enduring constant pain. I know that someone has talked about the possibility of raising money to provide surgery in China-- but others have suggested she wait to find a family here in America so that her health care could be the best possible! Getting her matched with a family could change this girl's life in miraculous ways.